The massive growth in SMA membership in Africa has necessitated major changes. We now have over 140 SMA missionary priests from Africa working alongside the members from the traditional Provinces and Districts in Europe and North America. With more than 150 African seminarians preparing for missionary priesthood in the SMA the future of our missionary apostolate seems assured. This growth has happened in just over 20 years. Our African members come from 12 countries and they work in thirteen African countries as well as in Canada, France and the USA. All African members until now belonged to the SMA African District-in-formation (ADF). Its headquarters was in Lomé (Togo) where a three man Council adminstered the DF. The growth in numbers made the task of administration of members from so many countries almost impossible. The 2008 SMA Plenary Council meeting in Rome decided to create three Districts-in-formation (DF) from the ADF. Each new DF will have a fulltime Superior, Vice Superior and Bursar. 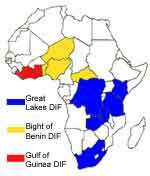 Bight of Benin DF: comprising the Regions of Benin-Niger, Central African Republic and Nigeria. Great Lakes DF: comprising the SMA Regions of DR Congo, Kenya, South Africa, Tanzania and Zambia. Gulf of Guinea DF: comprising the Regions of Ghana, Ivory Coast, Liberia and Togo. The new structures will ensure a more effective administration of SMA affairs in Africa. We thank God for the ever-increasing number of members of the Society and for the continued support of our benefactors who make our work possible. Details of the Districts-in-formation will be posted as they emerge. To educate a seminarian costs over €4,000 per year. With 250 seminarians in training to support this new initiative we need over €1 million each year.